Learn how to live joyfully in Afghanistan! Living in Afghanistan is not for the faint-of-heart. We have realized that many of us who have lived in Afghanistan for years have a wealth of information on how to live well among Afghans. This section is designed to try to describe all of the things we have learned to do to make our lives easier, fun for the children, while at the same time living "in community" and helping Afghans to improve their own lives through employment and furthering their eduction. 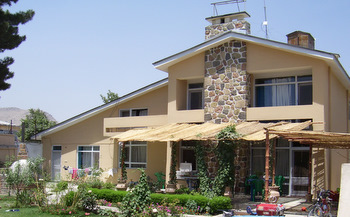 You will find that some foreigners choose to live very simply, more Afghan-style, and others have a mix of Afghan and western living in their homes. Do whatever works for you and helps you rest at home so you can live long-term in Afghanistan! If there is a topic not listed here related to living in Afghanistan, or you have a question about something, just contact us and we'll add your question - and our answer - to this section. Meat - How to NOT become a vegetarian in Afghanistan! Food Products - an orientation on specific food products from Iran, Pakistan, Russia, and the U.A.E. and are great substitutes to learn how to recognize and use! Wondering what to wear? Your guide to fashion dressing in Afghanistan. Healthy Living Tips for surviving Afghanistan joyfully! It is possible to live joyfully in Afghanistan. If you have a question not answered here, please contact us and we'll be happy to answer any question! Planning to come to Afghanistan? Get your FREE guide to Afghanistan. Everything a mom wants you to know.